On 22 October 2016, the World Head of the Ahmadiyya Muslim Community, the Fifth Khalifa (Caliph), His Holiness, Hazrat Mirza Masroor Ahmad delivered the keynote address at the 1st National Peace Symposium hosted by the Ahmadiyya Muslim Community Canada. The event was held at the Baitul Islam Mosque in Peace Village, Vaughan, with an audience of over 600 people, comprising government officials, including the Mayor of Vaughan, Hon. Maurizio Bevilacqua, Member of Parliament, Deb Schulte, and City Councillor, Marilyn Iafrate. 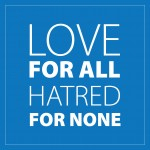 During his keynote address, Hazrat Mirza Masroor Ahmad said that the Ahmadiyya Muslim Community was an entirely peaceful sect of Islam because it followed the true teachings of Islam. Hence it should not be considered to be a ‘liberal’ or ‘reformist’ group. His Holiness referred to a saying of the Holy Prophet Muhammad (peace be upon him), that Muslims should love for others what they love for themselves. His Holiness said this principle laid down the foundations for peace and it was incumbent on Muslims to reflect upon this. His Holiness said that conflicts arose between people and nations from time to time, however rather than prioritising self-interest, they ought to be resolved with justice and fairness. The Caliph referred to chapter 4, verse 136 of the Holy Quran that requires a Muslim to be willing to testify against himself, his parents and his loved ones in order to establish justice. His Holiness said that Muslims are in fact commanded to go beyond the level of adopting justice. The Holy Quran says that a person should “give like kindred”. Referring to the treatment of prisoners of war, His Holiness said that in the modern world it was often the case that prisoners were kept in inhumane conditions with little or no recourse to justice. In complete contrast, His Holiness narrated the example of the Battle of Badrwhere the non-Muslims of Mecca waged a war against Islam. The Muslims were victorious and the Holy Prophet Muhammad (peace be upon him) instructed the prisoners or war that could read and write to educate the Muslims who were illiterate. This was their means of freedom. Highlighting the Quranic teaching of not casting envious looks at the wealth of others, His Holiness said that ignoring this principle had led to world’s peace being undermined time and time again. Concluding his address, His Holiness warned of the possibility of an imminent Third World War. Prior to the keynote address, various dignitaries spoke about the importance of peace and the efforts of the Ahmadiyya Muslim Community. After the event’s proceedings, His Holiness met personally with dozens of guests and dignitaries.